The show is introduced by Evo, Lu and Chan - ambassadors from the distant future who have brought their theatre company back in time with them for our entertainment. They begin the journey by taking us to meet the hero of the hour - Charles Darwin. 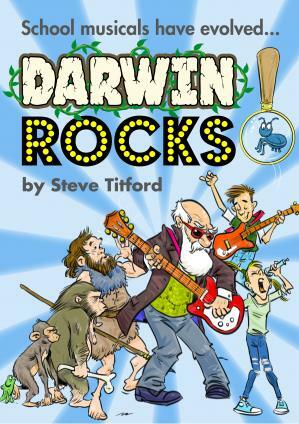 Through a pounding piece of power-rock, London's citizens explain why "Darwin Rocks!" Charles and his wife, Emma, struggle with the effects of fame as John Murray's exuberant marketing team attempt to give the scientist a makeover for the press. Exasperated by the thought of being turned into something he isn't, Charles remarks "It's like the Fuegians all over again". The action flashes back to an island off the south coast of America. The native Fuegians celebrate their oneness with their surroundings through the tribal song "Tierra Del Fuego (Land Of Fire)". Shortly afterwards, a British ship, the HMS Beagle, makes landfall. The British and the native Fuegians attempt to barter with each other - both offering various knickknacks from their respective cultures. Eventually a trade is agreed - Captain Robert Fitzroy of the HMS Beagle gets to take a group of Fuegians to show off to the royalty in the UK while Chief Chris of the Fuegian tribe gets given some shiny buttons. Both sides are very pleased! Emma and Charles, somewhat deflated from the crass nature of the earlier marketing meeting, stroll through London. They reflect on their individual differences and how they serve to make their relationship evolve. Wondering how Charles's theory will affect people's differing opinions on creation around the world, the couple sing the ballad "Two Creations" and are eventually joined by some London citizens. A dance-themed debate between scientists and traditionalists brings about an unusual pageant of our prehistoric ancestors. A chimpanzee and a Neanderthal are amongst the participants busting a move in the style of James Brown to the "Groove Of Evolution". Charles is on holiday with his relatives in Staffordshire as he contemplates marrying Emma. Whilst listing his reasons for and against the idea, he is visited by his friends. Emma unexpectedly walks in on the discussion that ensues from the list and is particularly offended at being branded "better than a dog, anyhow!" Distraught, she runs off before Charles can apologise for what would be some of his most famous remarks. However, her friends think that the list shows that Charles is serious about spending the rest of his life with Emma. In a split-scene jazz pastiche called "Better Than A Dog", Emma's friends and Charles's chums try to patch up the relationship. Emma and Charles are inspired to run and search for each other. When they come together, Charles proposes to Emma, who calmly produces a paper and a pen before replying "I'll get back to you". Charles, now an old man, has seized up whilst posing for a portrait. Thankfully, his wife and children come to loosen his body up (after a few sickening cracks and creaks!) Charles fears that the only memorable portrait of him will be an ape-like caricature. However, his family reassure him through a set of comedic flashbacks that he will be most remembered for his discoveries. Accepting that things change with time, the two children begin performing the song "Life Will Find A Way" and are joined by the chorus. The Ambassadors from the future sum up a few of Charles Darwin's achievements before taking us back to Tierra Del Fuego. Two years have passed since the trade between the Fuegians and the British. The British have just returned to the island, this time with Charles Darwin and three of the natives originally given to Captain Robert Fitzroy. Once reunited with their leader, Chief Chris, these three Fuegians decide that the British ways taught to them will be of no use in their own habitat. They promptly discard their British clothing for their old tribal attire - much to the approval of Chief Chris, the annoyance of Captain Robert Fitzroy and the amusement of Charles Darwin! Under the guidance of Chief Chris, the Fuegians' conclusion forms the basis of the up-tempo finale "Nothing Beats Being You".